I love to bake homemade bread from scratch using a bread machine! Couldn’t be easier and it makes some fantastic bread! This 100% whole wheat bread is an absolutely a perfect loaf, it’s the softest, moistest, fluffiest, freshest-staying, homemade, healthy 100% whole wheat bread you’ve ever had. If you’re looking for easy pancakes with 100% whole wheat flour, this one will do it for you. 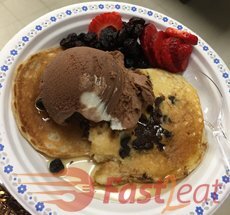 Last week I shared the Easy Basic Pancake Fast2eat. It’s simple and makes extra light and fluffy pancakes. Since it uses all-purpose flour, some people asked for one with 100% whole wheat flour. These come out very light, fluffy and delicious and are full of whole grain. I absolutely love the nutty flavor of the whole wheat flour.